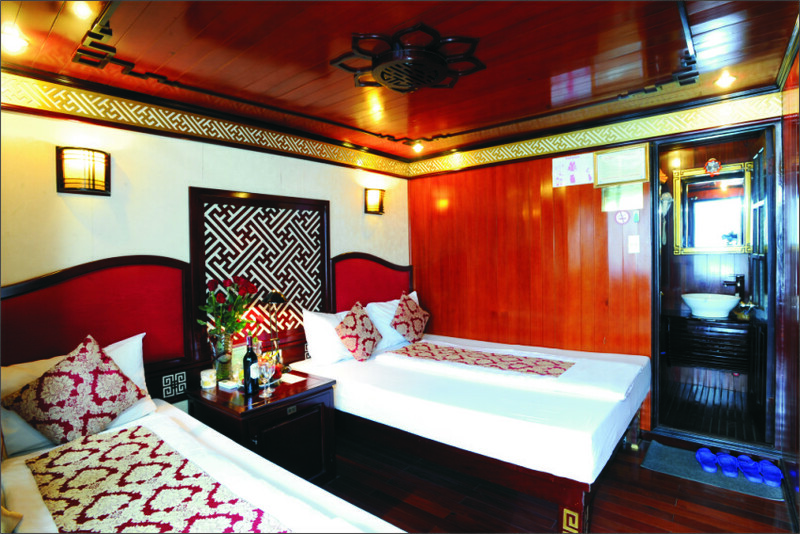 Halong Royal Heritage – Designed in oriental style but harmoniously combined with modern contemporary Vietnamese architectures, Our Team has two Cruises with 7 and 8 splendid Cabins. 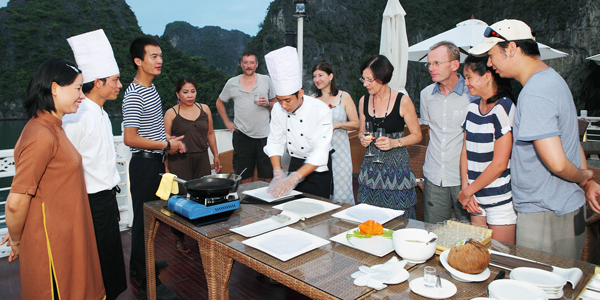 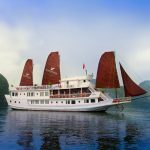 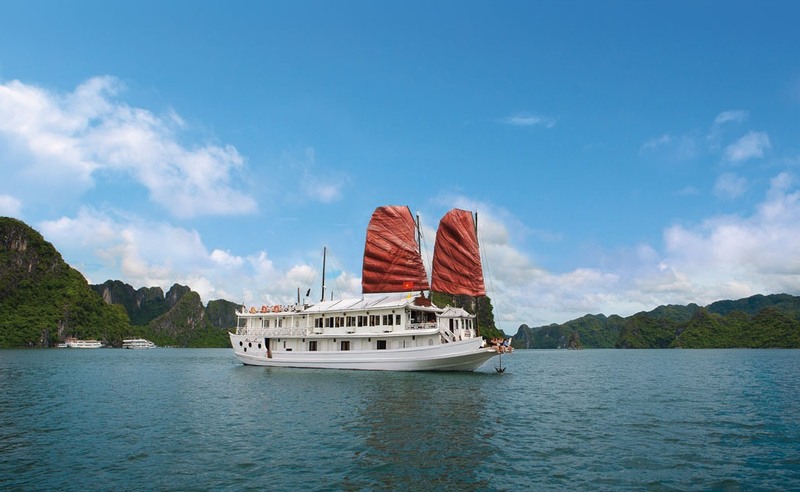 Both of them have large sundeck, comfortable lounging furniture, tidy-warm dining room, and exquisite bar-setting and together, in which they are equipped with outstanding facilities and large en suite marble bathrooms, is emerging to be one of the most charming cruises in Halong bay. 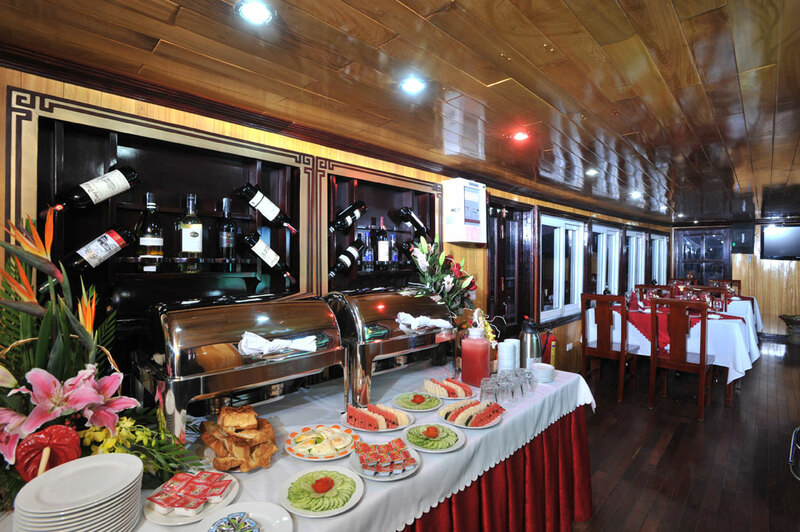 The Cruise 7 cabins has 2 deluxe cabins on 2nd floor and The Cruise 8 cabins has 3 deluxe cabins on 2nd floor Proudly, we have a professionally well-trained cruise manager taking care of every single service on board to guarantee the highest satisfaction for your customers. 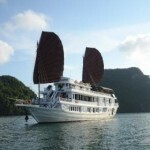 07h45 – 8h30: Our guide and shuttle bus will pick you up at your hotel or private address and then transfer to Halong city. 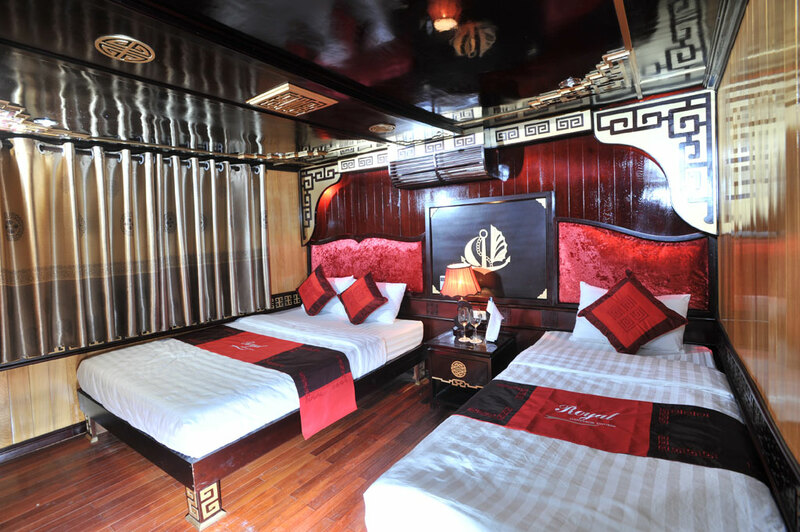 On the haft way, you have a short break around 20 minutes at Hai Duong city where you can experience our hand-made Vietnamese handicraft products such as lacquer wares, paintings, sculptures, embroideries, clothing etc, made by Hai Duong inhabitants and children war victims. 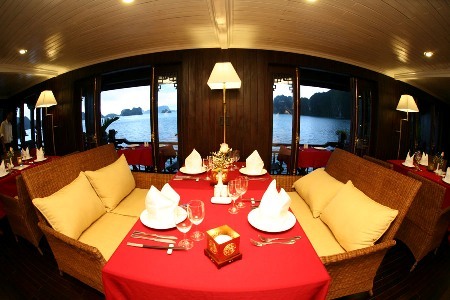 After that, we go straight to Halong city. 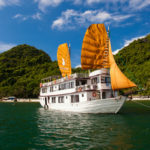 14h30: Visiting Ba Hang (three caves area) floating village by local rowing boat – one of 4 fishing villages serving major tourist attractions in Halong Bay, located in the region of well-known three caves, next to Thien Cung (heaven) grotto, Dau Go grotto … only with about 50 families spending their whole lives here. Excursion to floating village: Taking a rowing boat by a local woman and visiting the floating villages of fishing folk that will provide you with a unique cultural insight of warm and friendly people of the sea who have lived their whole lives aboard tiny bamboo boat. 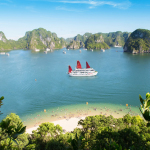 8h30: Drop anchor to explore Sung Sot cave (Surprising cave) – one of the largest and the most beautiful caves in Ha Long Bay, regarded as an Opera theatre on Ha Long Bay with 3 main chambers covering an area of over 10,000 sq.m. 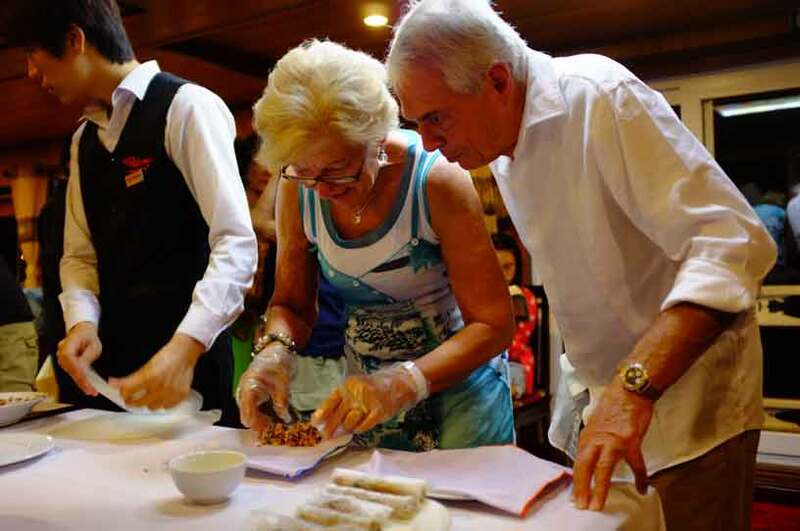 8h30: Transfer by tender to smaller boat to visit the pearl village – directly witnessed the pearl breeding, admire the pearl products – will be speccial souvenirs for your friends. 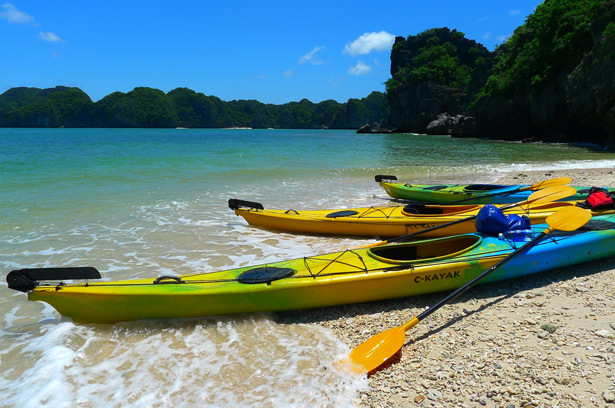 Then, explore Day and Night cave. Guided kayaking, swimming, a pristine natural cave lapped by the turquoise water.